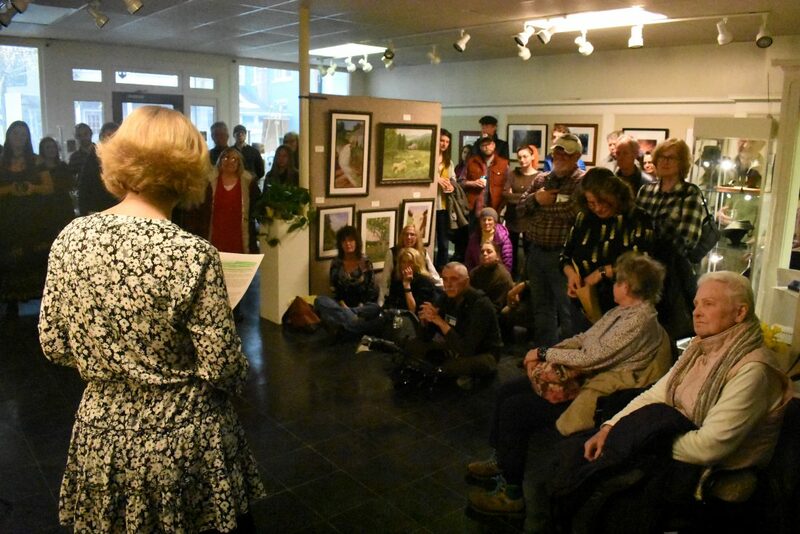 SARANAC LAKE — NorthWind Fine Arts gallery held its third annual poetry opening Friday. In a combining of media, poets and artists collaborated and expressed both written and visual art. 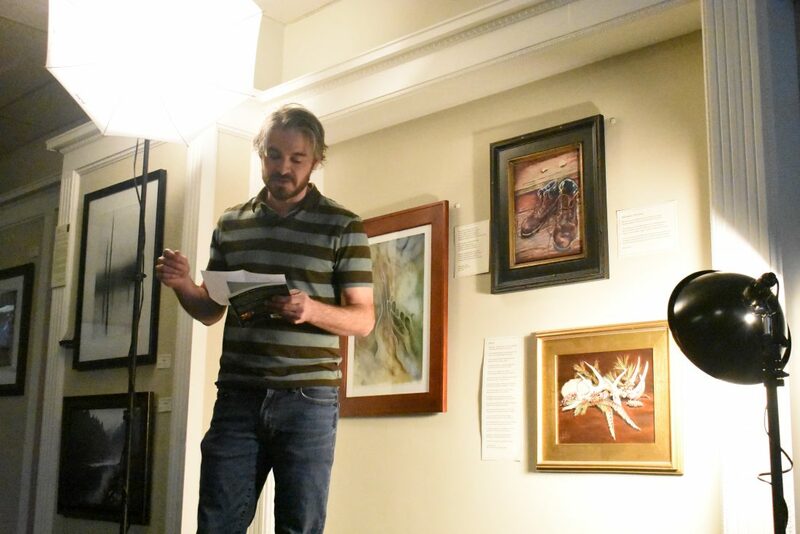 David Crews collaborated with painter Heidi Gutersloh and read a poem called “Still Life.” This is Crews’ third year at the poetry opening. In “Still Life,” Crews describes aspects of nature such as pine needles, white-tail deer antlers and pheasant feathers that eventually fall and become dirt. Gutershloh’s accompanying painting shows deer antlers surrounded by pine cones, pine needles and berries, looking almost like a centerpiece at an Adirondack wedding. “She shows all these things that fall off, and low and behold, here’s a poem about dirt because everything goes back to dirt,” Crews said. The poem has real authenticity when Crews starts to describe a glacial period in the Adirondacks that ended nearly 12,000 years ago or when he mentions the chemical and mineral make-up of dirt in the Blue Line — quartz, potassium, feldspar and garnet. Crews teaches English at West Morris Central High School in Chester Township, New Jersey. He said if he could go back and do things over, he’d like to teach science, too. His love for the Adirondacks extends to more than just his poetry. Crews works with the Northeast Wilderness Trust, a nonprofit out of Vermont that buys land for the purpose of preservation. NWT is currently trying to acquire the Eagle Mountain Wilderness Preserve in Essex County. Proceeds from his two books, which can be found on his website, davidcrewspoetry.com, will go toward helping NWT purchase the land. Crews said he loves the concept of blending media. He works with an organization called Arts for the People that does similar projects to the one at NorthWind. Nancy Scheffel Morse of Ray Brook read a poem called “The Peanut Man.” It describes a moment when she was a young girl, experiencing her first sensations of empathy. At 6 years old, she and her father walked through Central Park in Manhattan, when a man in raggedy clothes appeared, selling peanuts for 10 cents a bag. The man was a far cry from the suburban world she was used to. As Morse sat in the backseat of her family car, she looked out the rear window and saw the “Peanut Man” disappear into one of the park’s many tunnels, still hawking his legumes. She said that experience made her look at everybody differently. Morse later became a physical therapist and also does volunteer work, citing the “Peanut Man” as her motivation to help people and give back to the community. The accompanying piece was a photographic essay from Ed Williams. It shows seven images of his brother-in-law walking toward a tunnel. As he gets farther away, he starts to vanish into the background. Meanwhile, in the foreground, a little girl turns her head and watches the man disappear. Morse said collaborating with artists from other media is transformational.